When you Google “African safari vacations,” you get about 750,000 results. 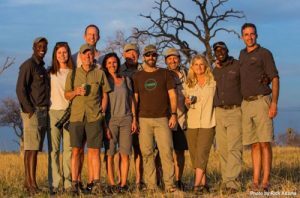 With so many folks chasing your safari dollar, and so many dollars in play, how do you make the right choice, that perfect “once-in-a-lifetime” decision that’s best for you? First, don’t just plunge in looking for the best, most appealing deal. Better to take a moment to reflect and make a list of what makes you happiest when you travel to places you’ve never visited before. Think about actual experiences and your favorite unforgettable moments. If your list includes words like inspiration, surprise, off-the-beaten track, educational, out of my comfort zone, culture, connection…put your pencil down. We have some talking to do. Here’s the thing. Most people go to Africa to see the animals, or at least that’s foremost in their minds. And there’s good news on this front. 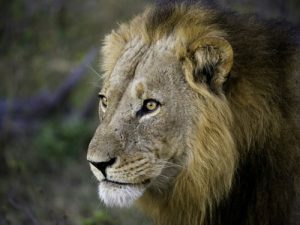 Pretty much wherever you go, if you select a reputable safari operator, you will get an amazing glimpse into Africa’s astonishingly diverse animal population and their natural habitat. We chose to join Tasimba (www.tasimba.com), a California company affiliated with Wilderness Safaris (www.wilderness-safaris.com) widely ranked as Africa’s top ecotourism company. And we chose well. On our carefully planned and curated trip to northwest Zimbabwe with Tasimba, my wife and I saw lions, elephant, leopards, giraffe, hippos, all kinds of antelope and a wide variety of birds, and insects. And there were no hidden costs or inflated promises. The accommodations were lovely and the flights on all manner of aircraft went off mostly without a hitch (Africa works far better for the tourist than it gets credit for). We were able to check all the boxes we had anticipated. And our experiences were spectacular! All this because the folks at Tasimba elevated our trip above the mass of Google links and Disneyesque safari tours that give you lots of rapid-fire animal sightings but not much else. Their resolve to take us beyond those conventional safaris, to give us an extraordinary experience of the animals, plus a connection with the local people, plus an understanding of the courageous campaigns to preserve southern Africa’s natural environment, plus, ultimately, an intimate connection to a multifaceted world we could scarcely imagine. All because they possessed their own deep, intimate, enduring connection to their particular corner of Africa. They make it their business, day by day, to reveal to you why this place means so much to them. Which is why in the end it came to mean so much to us. And why, if you are fortunate enough to book with them, you too will come away with a rich collection of indelible memories of your own. It begins with a Zimbabwean ex-pat named Hugh Coppen. Hugh grew up on a farm not far from Harare, Zimbabwe’s capital. 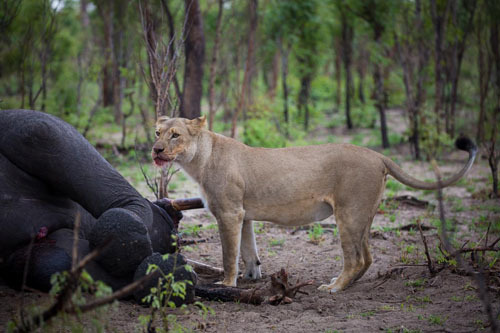 During his life he has been on dozens of safaris in the forests, plains and rivers of the Zimbabwe bush. In the late ‘60’s, as post-colonial self-determination strife tore apart his country, then known as Rhodesia, Coppen studied at the University of Cape Town under one of the thought leaders of South Africa’s African National Congress, and he embraced the vision of racial equality championed by Nelson Mandela. After graduating, and faced with the prospect of returning to Rhodesia and being conscripted into the military of the all-white minority regime, he made the heart-wrenching decision to emigrate to North America. But his heart never left the bush and he returned frequently over the years. Now, after a successful career as a CEO and executive coach in Canada and the U.S., Coppen leads small groups of visitors back to his homeland. To discover this corner of Africa through the eyes of a man who not only grew up there but who reveres, understands and commits himself to preserving its unique cultural and ecological treasures is to experience the essential uniqueness that we signed up for. It begins in earnest when Coppen asks you to turn off your cell phone. You see, there is no access to email, TV, radio, or the web in the 140,000 acre Linkwasha concession in Hwange National Park where Tasimba operates. There is radio contact for use in cases of emergency, but you are blessedly and decidedly off the grid. The Linkwasha camp where we were based is something out of an Isak Dinesen memoir. It is simple and sturdy, with carefully constructed tents covering beautifully appointed living areas. Each guest tent has views out over the savanna landscape, and decks where you can sit and gaze, especially at the elephants who cycle through at least once a day to drink at the waterhole a stone’s throw from your tent. You have electricity, state of the art plumbing, canopied beds, showers, bureaus, desks et al. 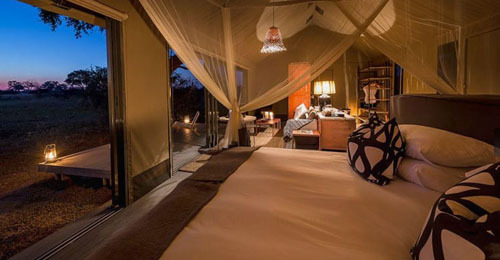 Best of all, Tasimba reserve the entire camp for their groups. No other tourists shuttling in and out, just you and your group for six days (typical safaris schedule three days per site, then it’s on to the next). You can’t help but become deeply invested in this place and this time. 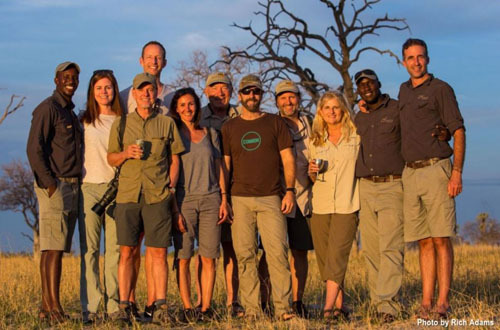 But the special sauce of this safari experience is the careful week long curation of the experience by the Tasimba team of Coppen and his business partner, Heather Weaver. 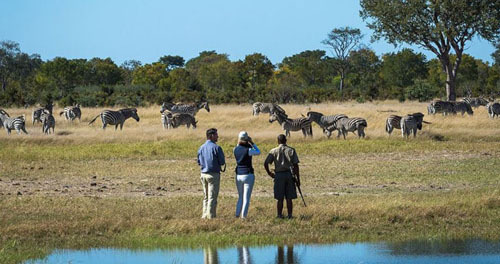 In tandem with the guides and staff from Wilderness Safaris, they reveal an amazing world of natural beauty, stimulating discussion topics, environmental stewardship and incredibly diverse animal life, one exhilarating day at a time. For instance, the elephants. There are 45,000 of them in Hwange National Park. Across Africa you can find safari companies that will get you out among these great regal beasts. But with Tasimba, by design, you are alone with them. There are no lines of tour buses scooting from one herd sighting to the next. There are no other tourists in your vast private wilderness, period. 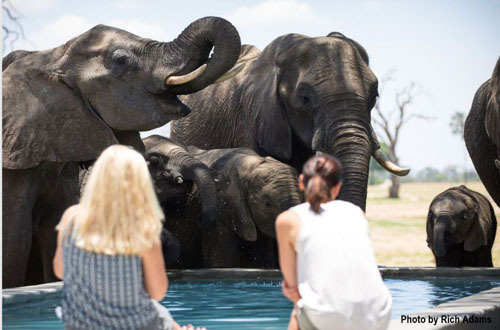 You can observe, for as long as you wish, a family of elephants of all ages trundle up to any one of the many waterholes throughout the concession. You watch transfixed as a calf becomes separated from her mother. Panicked, she runs to and fro trumpeting her distress, until another female in her family appears out of the bush about a half mile away, making some signal or sound to give the distressed one the proper direction. It’s impossible to overstate the positive impact of our guides. They are the intermediaries and interpreters of our experiences. We are introduced to every imaginable flora and fauna through them. Their encyclopedic knowledge puts no limits on what we learn and understand. But it is their special ability to connect the animal and human worlds, behaviorally and emotionally, that is a constant revelation. And good on that, because the sheer numbers of other species in our midst is stunning. Hippos, wildebeest, giraffes, zebras, impalas, cheetahs, baboons, leopards, and, of course, lions are living all around. 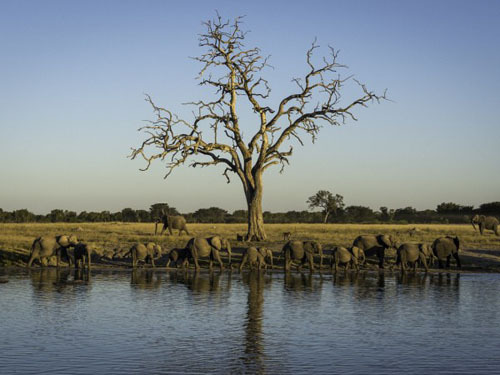 From the termites and the dung beetle to eagles, vultures, owls and cranes, the bush is home to a staggeringly rich interconnection of nature. And every time you brush up against it you are struck by its power, its beauty—and also its fragility. 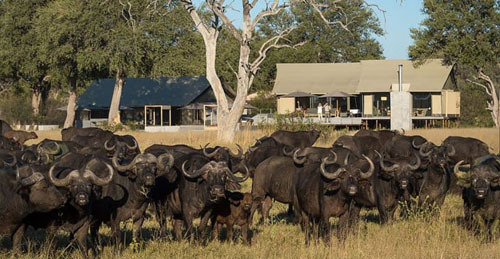 Respect, reverence even, for conservation is woven tightly into the Tasimba experience. Coppen knows and illuminates in frequent conversation the difficult history of Zimbabwe’s efforts to preserve its remarkable natural legacy. One afternoon, he arranges a visit to Linkwasha’s anti-poaching unit known as the Scorpions, whose efforts are supported financially by Wilderness Safaris. These men are the first line of resistance to the international smuggling rings who are driving the black market sales of ivory in Asia. 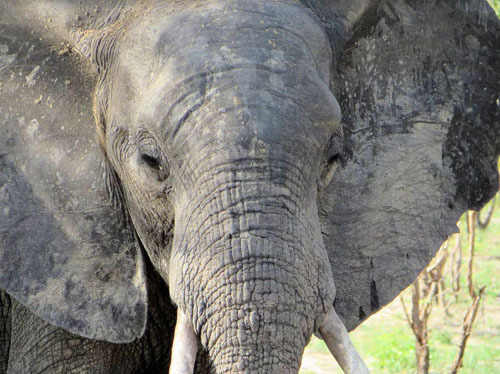 The smugglers hire hunters who covertly enter preserves like Hwange to kill elephants, remove the tusks and deliver them to the smugglers. The Scorpions have deployed themselves to stop these crimes, by force if necessary. As the Scorpion leader describes their efforts (much of which are focused on educating and winning over local people in the villages who are potential recruits for the smugglers), he paints an encouraging picture of swelling public sentiment in favor of protecting the animals. He says the vision of an improving local economy driven by a growing tourist business with direct trickle-down employment and other benefits to the local population is catching on. Another day we head for the village of Ngamo on the outside edge of the park. There we sit down with the headman of the village and his wife, who care for and lead a community of more than 400, making sure everyone has enough to eat, and that children get a primary and even secondary education. We hear the same conviction from the headman of the benefits to the village brought by the safari camps in the National Park. Later we visit the primary school and its headmaster who, with limited resources, has fashioned a remarkable education experience for his kids who have begun to glimpse a future where jobs as guides and service personnel in the camps or as drivers and pilots transporting people in and out of the region are becoming a realistic option. We spend the afternoon in lively conversation with the students as they showcase their learning and pepper us with questions about world music, fashion and sports (Do we prefer Beyonce or Rihanna? Messi or Ronaldo?) Their brief song and dance performance leaves everyone smiling, not least we visitors. 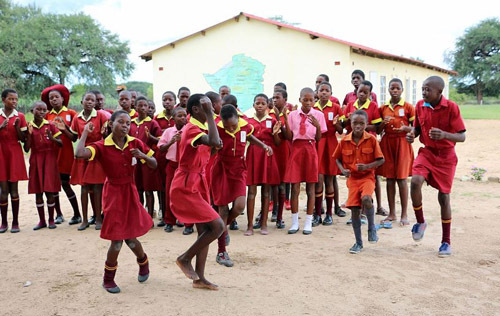 When the headmaster explains how without support from the tourism, the school could not function as it does, it’s a humbling reality check for us. As with so many great experiences, it is invariably the seemingly smaller details that sometimes can be the most distinctive. Every night of our trip after making our way back to our tent after a savory dinner and engaging campfire conversations with our fellow guests, guides, Coppen, Weaver and the rest of the team, there was placed upon our bed some special token of our African experience. 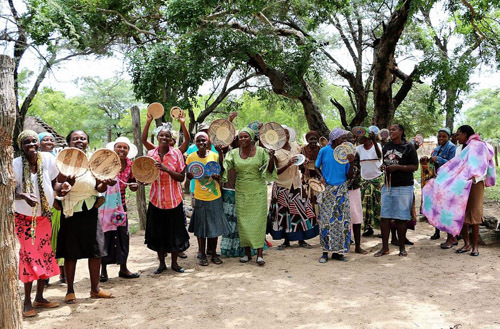 A book, a necklace from a local village artisan, an African mbira- a finger piano – or an African proverb or story that explains something that we most likely experienced in the bush earlier that day. This is Weaver’s work and for its generosity, its celebration of something uniquely African, and for its carefully curated, perfect punctuation point on a nearly perfect day, it is truly inspiring. 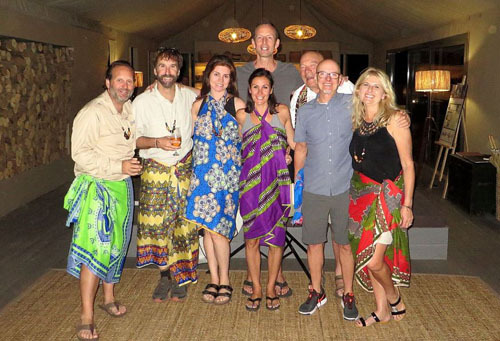 On our last night, all our hosts—the guides and the whole staff at Linkwasha camp, the Tasimba team, some of the Scorpions, all assembled to sing and dance with us. Though I will refrain from describing the dance moves of the North Americans, I will say we were all gamers and by night’s end revealing newly elevated levels of rhythm and agility. But it was the last song with the Zimbabwean ensemble swaying and singing in their native Shona language that left its mark on me. The song was their national anthem, translated from the Shona, it is titled “We, Zimbabwe.” To observe the emotions and pride swell across the faces of the kitchen workers and housekeeping staff; to see our guides and the team that operated the camp drop for a moment their veil of professionalism and throw themselves humbly but enthusiastically into the moment; to watch the tears well up in Coppen’s expariate eyes as he stood and sang with his countrymen, was, like Weaver’s carefully selected daily gifts, the perfect capstone on an extraordinary experience. As mentioned, there can be a Disneyesque way that tourists visit Africa – a few days in a packed Land Rover, driving through crowded parks to get a glimpse of one of the “Big Five” (elephant, rhino, lion, buffalo and leopard), checking the box on the experience without ever really understanding the deeper meaning of Africa, its people and their connection to the land and the animals. Fortunately for us, we didn’t select one of those safaris. We made the right choice, that perfect “once-in-a-lifetime” decision. To discover through our Tasimba experience that there exists an alternative, unhurried, genuinely more profound way to experience Africa was our great reward.